Jacque Weems specializes in luxury estates, waterfront, view homes and golf communities in Sedona and the Verde Valley in Arizona. During her 15 year career she has been active in selling real estate, teaching real estate and providing clients with title and escrow services while employed by First American Title where she was awarded the employee of the year two consecutive years. 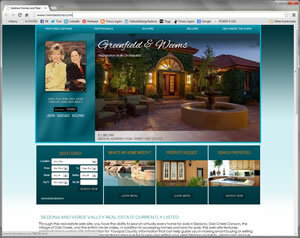 She is half of the partnership of Greenfield & Weems Real Estate Consultants. Jacque and her team have served more than 500 families with their real estate needs over the past two decades. Well known in the real estate industry for her innovative, high quality, results driven marketing, Jacque has been honored multiple times with leadership roles and awards. She has been selected by her peers to act in their behalf to represent them at the state level and in Washington, D. C. as a board of directors member and, in 2008, as their president. Pioneer Title has bestowed her with the top 20 Award for eight consecutive years. She holds a teaching certificate approved by the Arizona Association of REALTOR® and has taught real estate specific classics at Yavapai College and with the Sedona/Verde Valley Association of REALTOR® to over 500 students. She earned her E-Pro designation in 2004 and is considered a local real estate reference for information regarding computer programs used in the real estate trade. Jacque is an Ombudsman for the Arizona Association of REALTOR® , where she is assigned to cases, at the request of AAR, to settle disputes to prevent the need for mediation, arbitration or litigation. Jacque served two years on the Big Park Site Council, where she volunteered on a committee of selected parents, teachers and the school principal in 2006 and 2007. She is proud to have served in a school district now entering its eighth year as an excelling school. Jacque is a graduate of the Arizona Association of REALTOR® Leadership Training Academy. She enjoys coaching and sharing her expertise with other agents to help them provide consumers with the highest level of care to their clients. She is a founding member of the Sedona Luxury Real Estate Professionals. Originated in 2004, this is a dynamic, unique and cooperative group of Sedona's top luxury real estate specialists who represent a diverse segment of real estate companies in Sedona. In 2002 Jacque joined forces with Jolynn Greenfield and they formed their own marketing company, The Real Estate Consulting Team of Greenfield & Weems, which focuses on developing strategies and marketing materials for select properties and their owners who wish to sell. She works with only a small group of buyer clients at a time and helps them find the property most suited to their lifestyle and their future goals.